Siegfried Nacht (1878-1956) was active in the international anarchist movement around the turn of the century. 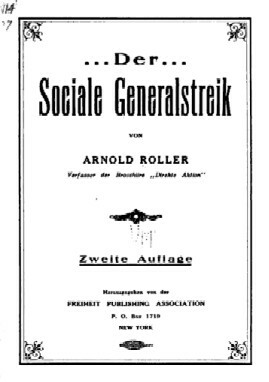 In 1905, under the name of Arnold Roller, he published his influential pamphlet, The Social General Strike. Max Baginski and a group of anarchists circulated it at the founding convention of the Industrial Workers of the World in Chicago in June 1905. Kôtoku Shûsui (1871-1911) obtained a copy when in contact with American anarchists in San Francisco and translated The Social General Strike into Japanese. Kôtoku then introduced Chinese anarchists to the pamphlet, and Zhang Ji (1882-1947) translated it into Chinese. In October 1905, there was a massive general strike in Russia which made a deep impression on workers and revolutionaries around the world, giving renewed credence to anarchist ideas, for it was the anarchists who had been advocating the general strike as a revolutionary weapon since the time of the First International (Anarchism: A Documentary History of Libertarian Ideas, Volume One, Selection 27). The Marxist social democrats, taking their cue from a 1873 Engels’ pamphlet against Bakunin, “The Bakuninists at Work,” had been dismissing the general strike as “general nonsense” for years, as Nacht notes in his pamphlet. Kropotkin observed that “what exasperated the rulers most” about the general strike “was that the workers offered no opportunity for shooting at them and reestablishing ‘order’ by massacres. A new weapon, more terrible than street warfare, had thus been tested and proved to work admirably” (The Revolution in Russia). Despite this practical vindication of anarchist ideas, Malatesta was careful to point out the limitations of the general strike during the debate on syndicalism at the 1907 International Anarchist Congress in Amsterdam. Instead of “limiting ourselves to looking forward to the general strike as a panacea for all ills,” Malatesta warned, anarchists needed to prepare for the insurrection or civil war that would inevitably follow. For it is not enough for the workers to halt production; to avoid being forced by their own hunger back to work, the workers need to provide for themselves by taking over the means of production (Volume One, Selection 60). Nacht was one of the anarcho-syndicalist delegates at the Congress who spoke in favour of the general strike. He later emigrated to the United States, where he became a Communist fellow-traveller after the 1917 Russian Revolution, and later worked for the US department of Inter-American affairs. His brother Max Nacht, better known as Max Nomad (1881-1973), had also been an anarchist, then a follower of the early theorist of the “new class,” Jan Machajski, and then, surprisingly, a pro-Soviet socialist and later an unreliable historian and critic of anarchism. A complete copy of the Baginski translation was made available by Corvus editions and may now be found at: http://www.westyorkshiresolfed.org/resources/socialgeneralstrike-np.pdf. Below I have reproduced Part 1.